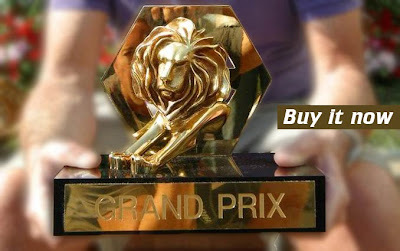 THE unique offer – only before January, 23rd you have a chance to get a tender on buying The Cannes Lions Grad Prix on an installment plan for several years with monthly payment. You will have a copywriter in your team during the installment period , working at your routine projects and meanwhile winning some other advert competitions. Please remember, this is a very rare offer and it exists in one copy only.